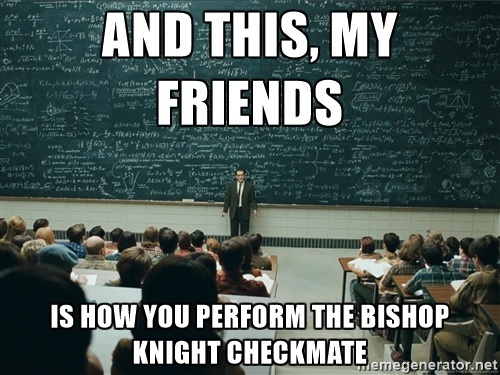 As promised some time ago, we will touch on the elusive Bishop-Knight Checkmate. While it rarely occurs in gameplay, it might someday still save you a crucial half-point. Besides, it's not bad showing off to your (non chessplaying) friends how to execute the checkmate, wouldn't it? This checkmate is easy to learn, but difficult to master. The reason it is so tricky is because unlike basic mates, it is tough building a "wall" that forces the enemy king to the corner. A queen, rook or two bishops can cut off entire files. With a bishop and knight, it isn't so easy. You need strong understanding of king opposition, square visualization, and even silent moves to carry out the job. Oh, and did I mention that that you need to abide by FIDE's 50-move rule? So every move counts. But like all basic mates, the fundamentals are the same. It's about trapping the enemy king and pushing him to the side of the board. You can only force mate in a corner that's the same coloured square as your bishop. 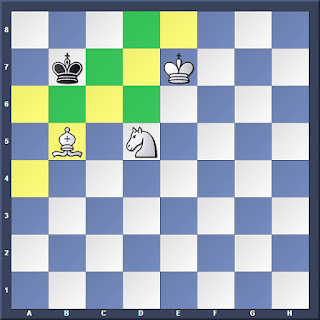 For example, if you have a light-squared bishop, you need to deliver the mate on a8 or h1. 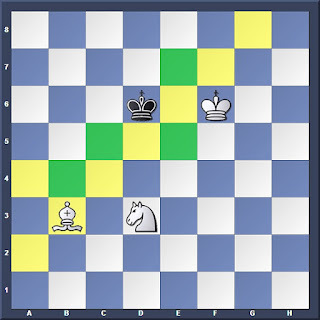 If your opponent is smart, he will tuck his king into the wrong-coloured corner since mate cannot be forced there. You must know how to pull him out from that corner towards the correct-coloured one. We will use a special tool called Deletang's Triangles: Successive shrinking triangles that push the enemy king towards the corner. Building them requires a team effort by king, bishop and knight. 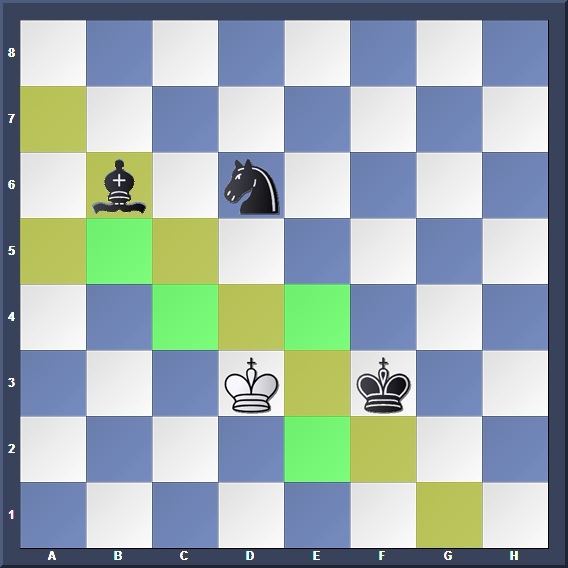 The king located on the opposite corner of the triangle, where he will use the technique of opposition to confine the enemy king. Why are these ideal squares? In the diagram, the bishop covers all the light squares along the triangle's border, while the king and knight fill up the dark squares. Notice Black's king cannot even touch White's minor pieces. In the medium triangle the ideal squares for the minor pieces are located at the same points along the triangle. Once again Black's king cannot escape his prison. 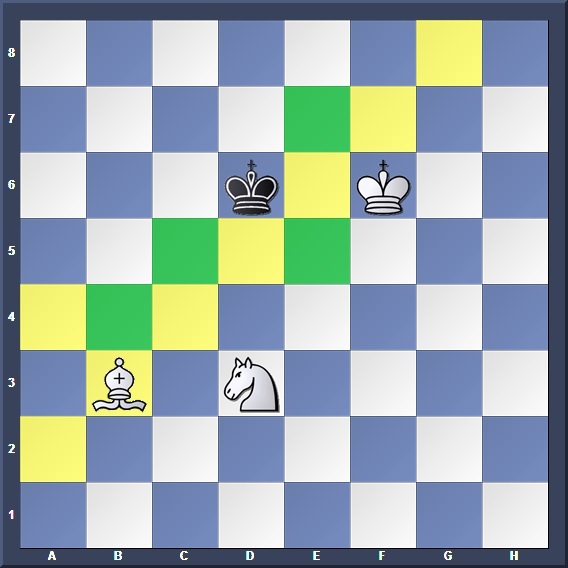 To shrink from one triangle to the next, you have to force the opponent's king to move inwards, before re-positioning the bishop to the diagonal of the smaller triangle. Force the opposing king from the centre of the board to one of the corners. If he goes to the right-coloured corner, jump straight to Step 2 and form the triangles. If he goes to the wrong-coloured corner, flush him our of there towards the correct corners. Once the small triangle is formed, deliver the checkmate. Take a look at the following game for a better illustration. As you look through, try to visualize the squares controlled by White to see how the "wall" is build. It looks simple at first glance, but reality is far from that. 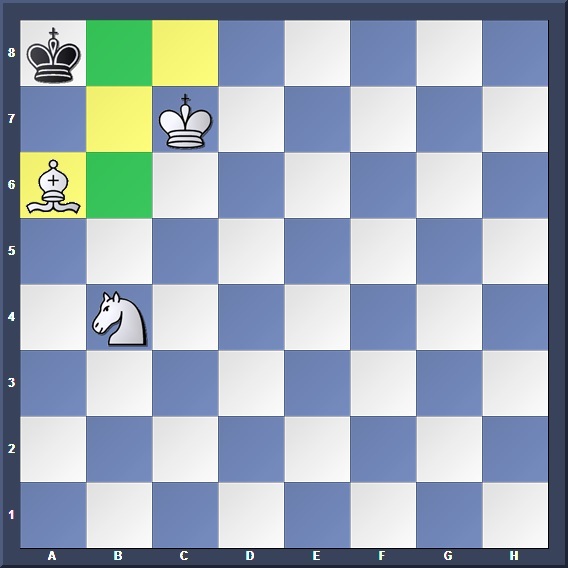 As stated earlier, this checkmate is easy to learn but difficult to master. The only way to gain a firm grasp is to keep practicing until it is ingrained in your head. Use the following link to hone your skills in the bishop-knight checkmate. Start by getting the technique right first, regardless of how many moves it takes. Once you are familiar, try to do it within 50 moves. It is difficult at first, but over time you will get well-versed with the concepts.